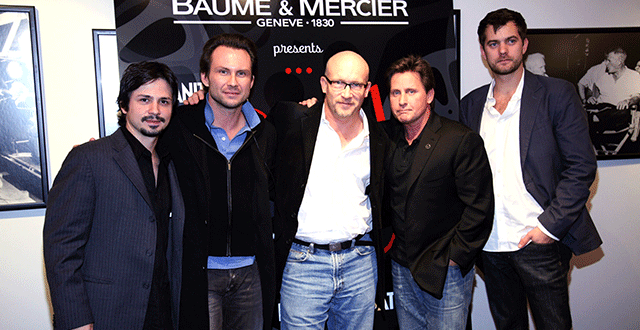 The Film Foundation, Vanity Fair Magazine, and Baume & Mercier co-hosted a Reel Talk event surrounding Emilio Estevez's new film, BOBBY. Held at the DGA Theater in NYC, the evening featured a screening of the new film, followed by a discussion with Estevez and cast members Joshua Jackson, Freddy Rodriguez, and Christian Slater, moderated by filmmaker Alex Gibney. A reception was held at the Estrella Penthouse of the Parker Meridien. The evening was one in a successful series of Reel Talk events, co-hosted by The Film Foundation and Vanity Fair Magazine, celebrating the art and history of film and highlighting the importance of film preservation. Special thanks to Directors Guild of America, American Century Investments, Jamaica Tourist Board, Lufthansa Airlines, Metro-Goldwyn-Mayer Studios, Inc., The Weinstein Company, and Bold Films.